One Birmingham, Ala. student has died following an “accidental” school shooting during dismissal on Wednesday Birmingham City Schools confirmed in a statement. Huffman High School was briefly placed on lockdown as police were called to the scene. Students were later released and police are continuing to investigate the circumstances of the shooting. Wednesday evening, Birmingham Police Chief Orlando Wilson confirmed one female student, 17, died on the way to the hospital, and a male student, also 17, is in critical but stable condition. According to AL.com an adult victim was treated and released at the scene. 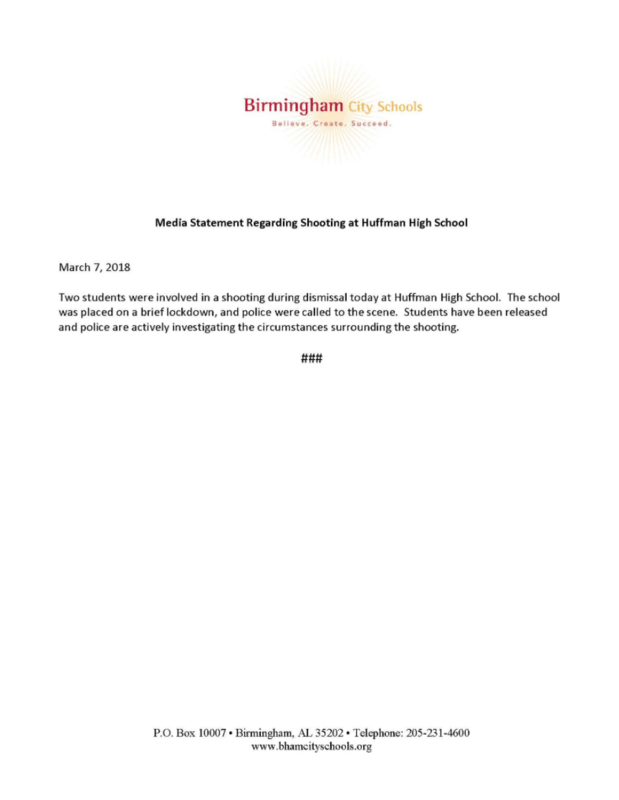 Birmingham Mayor Randall Woodfin held a press conference at the school at 5:45 p.m., less than two hours after the incident. Wednesday evening, Gov. Kay Ivey responded to the tragic news.